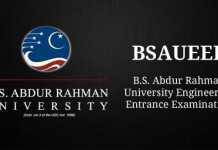 BSAUEEE 2018 Slot Booking and Admit Card – B.S Abdur Rahman University will issue admit card for the entrance examination, BSAUEEE 2018 on its official website. The entrance examination will he held as per the schedule and admit card will be available for download few weeks before the commencement of the examination. The admit card will contain details of the venue, date and time of the examination. To download the admit card, applicants will first need to do Slot Booking for BSAUEEE 2018. Only after completing slot booking, you will be able to download the admit card. Like admit card and slot booking, result of BSAUEEE 2018 will also come online. Read all the instructions printed on the admit card carefully. You may be required to bring documents for the exam. The list of documents will be printed on the admit card. So, it is advised to check the instructions and rules & regulations carefully. It is mandatory for students to bring the admit card for the examination. Any student without an admit card, and the relevant documents will not be allowed to sit for the examination. Candidates who have successfully registered and have done slot booking will be issued admit card. How to download the BSAUEEE 2018 Admit Card? You need to visit the official site at http://www.bsauniv.ac.in/. Click on the link which says Exam Slot Booking. Enter the Registration Number and Date of Birth in the given fields. In slot booking, you need to chose the centre, date and time of the examination, as per your convenience. As soon as you will finish completing slot book, a link for downloading the admit card will appear on your screen. Download and take print of the admit card. Check if all the details mentioned in the admit card are correct or not, if there is any kind of discrepancy in the admit card, contact the University authorities for such issue. Insofar, official details of BSAUEEE 2018 admit card have not been announced. Information on this page is as per last year exam and for reference. 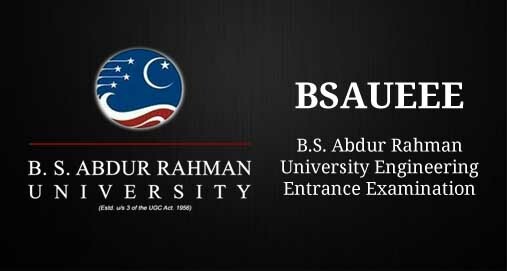 As soon as B. S. Abdur Rahman University releases BSAUEEE 2018 information brochure, details will be updated here. If you have any queries regarding BSAUEEE 2018 Admit Card, please ask in comments below.